I was planning on thanking my husband on today's blog. Thanking him for washing up and cutting the veggies for the week. (It's a long process when we use as many vegetables a day as we do.) He washed and cut so I could sew and sew. I was able to almost finish the second kids' quilt top in as many days. But I also need to thank the kitty today, too. 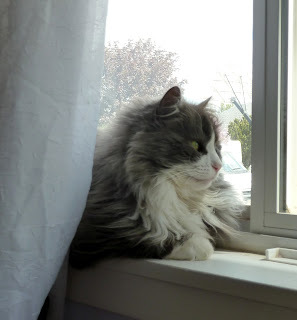 She kept me company, sitting in the window of the sewing room as I did all that sewing. So when it came to the picture for the day the choice was easy. The cat makes for a much cuter picture than hubby and/or vegetables.